L'Oreal Sculpt Range | HIT or MISS? If you are a beauty fanatic like me you would have heard about the new, exciting L'Oreal Paris Sculp range that's hit our drugstores over the last few weeks. As soon as I saw the new products out in stores I knew I had to get my hands on a few goodies to see what all the hype was about and obviously within no time it's made it's way onto my blog. Firstly starting with the False Lash Sculpt Mascara | £9.99. L'Oreal state this is the revolutionary mascara that will add the perfect frame to your eyes. It claims that after just one stroke, you'll experience 3 sculpt effects; Tight lining at the root and upper waterline, Added volume at the core and a brisk fan out at the tip of your lashes. So with such high claims and the credible reputation of previous L'Oreal mascaras I had high hopes for this one..
And the Flash Lash Sculpt Mascara delivered. I've been testing this mascara for the last week or so and have to say it's made it's way into my everyday make up routine recently. It's such an easy product to work with and it's true.. After one stroke you can see a noticeable difference! I love when brands come out with unique and innovative concepts and this one has hit the nail on the head! It's a great buy and perfect for them early mornings when you're in a rush to get ready. The only downfall I would state with this mascara is that it can be a bit tricky to work with at first. If you're anything like me you switch the angles of your mascara wands when applying on different sides of your face but with this mascara you may struggle when trying to reach the inner lashes of your left eye (I'm right handed). It's nothing you can't master after a few go's but it does mean you may not fall in love with the product immediately. Overall, this is most definitely a HIT for me! 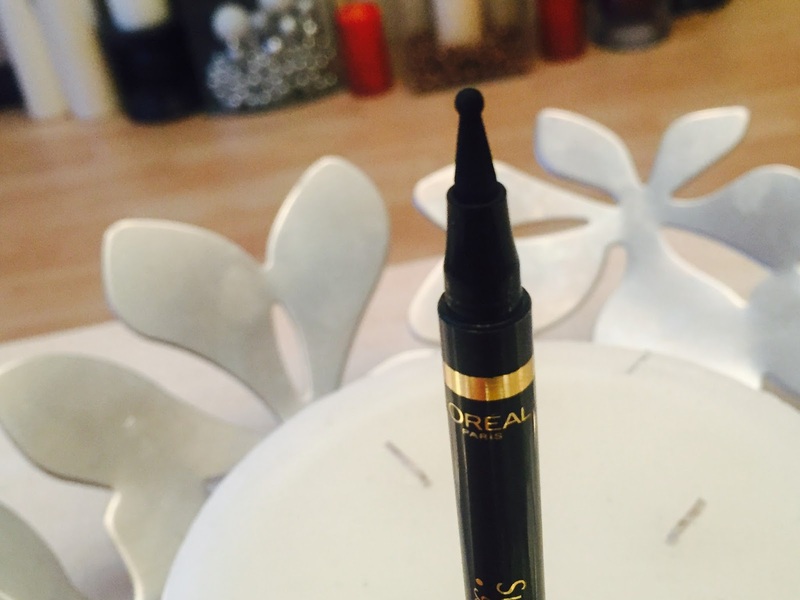 Next we move on to L'Oreal's Black 'N' Sculpt Super Liner | £6.99. This product made it's way into my basket simply out of curiosity. I usually define my favourite felt liners by their narrow, precise nib as these have commonly been the easiest to work with an apply (especially if you're like me and are YET to master the winged eye liner look) however, I was interested to see what L'Oreal were thinking when they introduced a spherical eye liner tip. It claims to help contour the eyes from any angle and create a sculpt look (I'm not going to lie that doesn't even make much sense to me) but it sure does sound fancy so I gave it a go. But unfortunately this is a huge MISS for me. I found the spherical tip made application so difficult and almost impossible. I couldn't understand how this little devise could provide any accuracy and it was all a bit of a faff. I tried using it in three different ways, one for the classic winged eye look and it was a massive fail, then went to just line my upper lash line again a huge fail and even tried to apply it under my bottom waterline to seal my khol liner (yeap that's a great trick by the way it stops it smudging) and again the line was way too thick and all over the place. Another downfall was the fact that the product seemed to come out quite patchy and dry which made it even more difficult to work with. I'd love to fall in love with this because like I mentioned I love innovative beauty launches but I couldn't come to grips with this product and it's lost somewhere at the bottom of my liner draw. Overall I would highly recommend getting your hands on the L'Oreal Paris False Lash Sculpt Mascara as it's replaced the majority of my favourite mascaras but stay clear of the Black "N" Sculpt Super Liner and don't let curiousity get the better of you, like I did. Have you tried out these products? What about any of the other products from L'Oreal's Sculpt range? Let me know how you got on with them below! I picked up the same two products and hated the eyeliner pen aswell. It doesn't make any sense to me and now I feel like I've wasted my money! I like the mascara though, but the push up liner is better. The Mascara looks so good, and the eyeliner looks quite scary! I'm not the best at eyeliner even using a fine tipped applicator so I know this wouldn't end well for me!